So many of us hate our ego, our inner critic and judge. We want to get rid of it so we can evolve into more spiritual beings. This inner violence (yes it is!) only reinforces the ego’s survival instincts. It will find an other way and grow stronger faced with adversity…. and the battle continues. 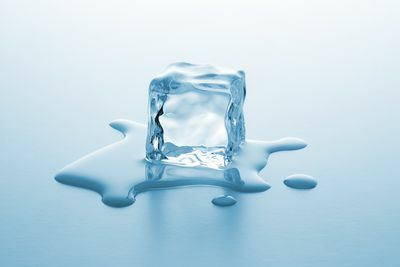 “Think of ego as a great block of ice. When you slug ego, you play by its hurtful and pain-inducing rules. You bruise your knuckles and grow angrier each time you slug it. But when you hug ice, it has no choice: it must gradually disappear. Not immediately, no; but if you persist, it will melt, will it not? This is precisely how it works to rid yourself of ego. Hug it and it melts away. And what remains is the oceanic freedom that is the pinnacle of human existence—the freedom to live, to love, and to be loved. I have read many different approaches to dealing with ego on our spiritual journey. This is one that really resonates because it comes from the heart and not just the intellect. If this perspective fascinates you, and you want to explore more deeply, I would highly recommend checking out the amazing resources at David Mutchler’s WordPress blog Evolutionary Mystic. I am one who tends to struggle with ego…I like this idea of it as hugging ice. This is beautiful Val. The image of ice and its melting in warmth is exquisite. So much proposed by religion has placed the emphasis on that pounding you speak of. Marvellous post. I agree Don. Thank you for this insight. Some religious leaders can be pretty violent about ego…. and I’m guessing its because they are struggling so hard with beating down their own ego in order to attain awakening. That last sentence of yours is so profoundly true, Val. Some of the most egotistical people are intensely religious. I know, I was one. I view Ego as an amusing and demanding toddler . . . intent on getting what it wants when it wants it. Battling head on with a toddler is exhausting and self-defeating. Far better to watch Ego with detached amusement and affection. Water is fluid. What I like about this analogy is if you hug a cold cube, your warmth melts it into a adaptive, liquid that can go anywhere and become so many things. It nourishes and enriches all that it touches. Ego transformed in this analogy is love. Yes Noelle! I love that. The ego isn’t killed it transcends just as the ice transforms to water. BTW – It’s the first Yama and the most important to live by in yoga. ‘Soul Without Shame’ by Byron Brown is a must read in dealing with the inner critic too, my teacher once told me to love it to death, kinda fits with ice idea too. I want to hug you and this post, Val! I like this, Val. I see the melting as a melding. Integration. Ego and Soul are essential together. Thank you! Love this, Val! Thanks for sharing it. That is because, I struggle with the concept of self-love, thinking it makes me selfish – this puts a better perspective on it. We do have to love ourselves before we can love others. The Lord loves us all unconditionally. I see my flaws and become self-critical, but then I realizes he loves me no matter how much I weigh, whether I am feeling sad or happy he is there. But I still struggle with feeling selfish and inadequate. Thank you for this helpful post.